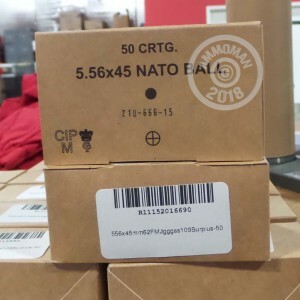 Looking for an inexpensive 5.56 NATO mil-spec load that will deliver reliable performance in your AR-15 or other .223 Remington/5.56 rifle? Pick up this 1,000 round case of Lithuanian surplus ammo and get free shipping from AmmoMan.com! These cartridges come in a case of 1,000 and fire a 62 grain SS109 full metal jacket bullet at 3,100 feet per second. This results in external ballistics comparable to those of American made M855 ball ammo. This ammunition uses non-corrosive Boxer primers and reloadable brass cases. Each case is packaged in a reusable metal ammo can.